By Special Collections Research Center, Swem Library, College of William and Mary. 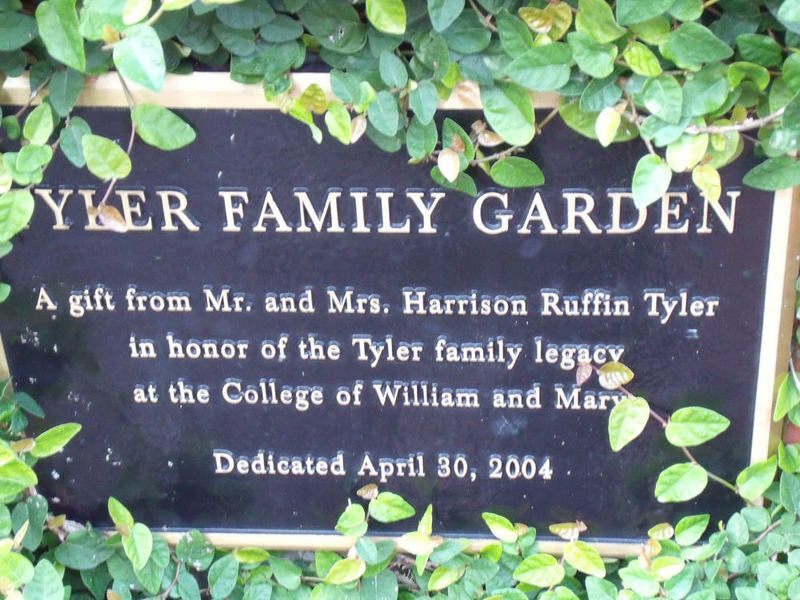 In recognition of the lasting ties between the Tyler family and William & Mary that span three centuries, a garden was dedicated at the university on April 30, 2004 just west of James Blair Hall. 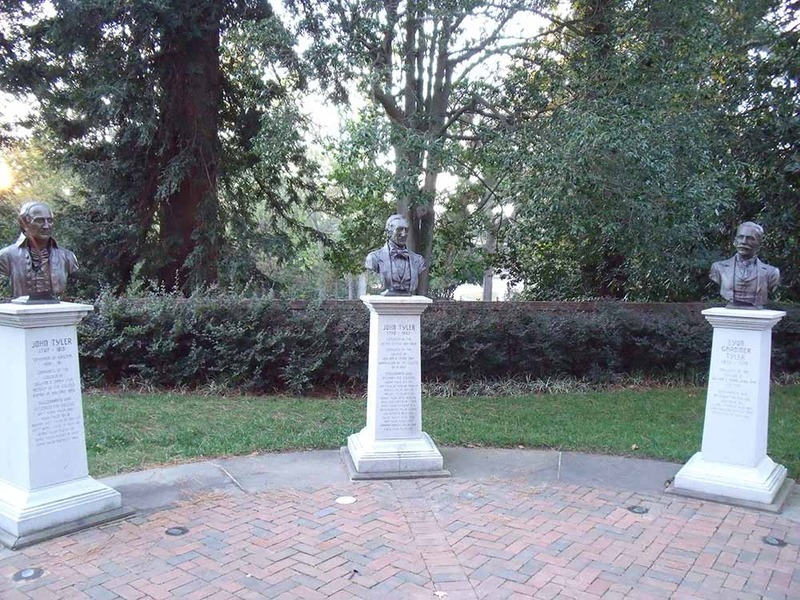 The Tyler Family Garden includes bronze busts of three members of the family – Lyon Gardiner Tyler, who served as the 17th president of William & Mary from 1888-1919; his father, the 10th U.S. President, John Tyler, who served as rector and chancellor of the university; and Lyon Gardiner Tyler’s grandfather, John Tyler, Sr. who served as the 18th governor of the Commonwealth of Virginia. The Tyler Family Garden is part of an endowment gift from Mr. and Mrs. Harrison Ruffin Tyler, son of Lyon Gardiner Tyler, to William & Mary’s history department. The garden is located outside James Blair Hall which houses the history department, now named the Lyon Gardiner Tyler Department of History. Tyler Family Garden, 2011: The Tyler Family Garden from the side of James Blair Hall in 2011. ~ Source: University Archives Photograph Collection, UA 8. ~ Creator: College of William and Mary. Tyler Family Garden Dedication Plaque, 2011: A photo taken in November 2011 of the Dedication Plaque of the Tyler Family Garden next to Blair Hall. ~ Source: University Archives Photograph Collection, UA 8. ~ Creator: College of William and Mary. 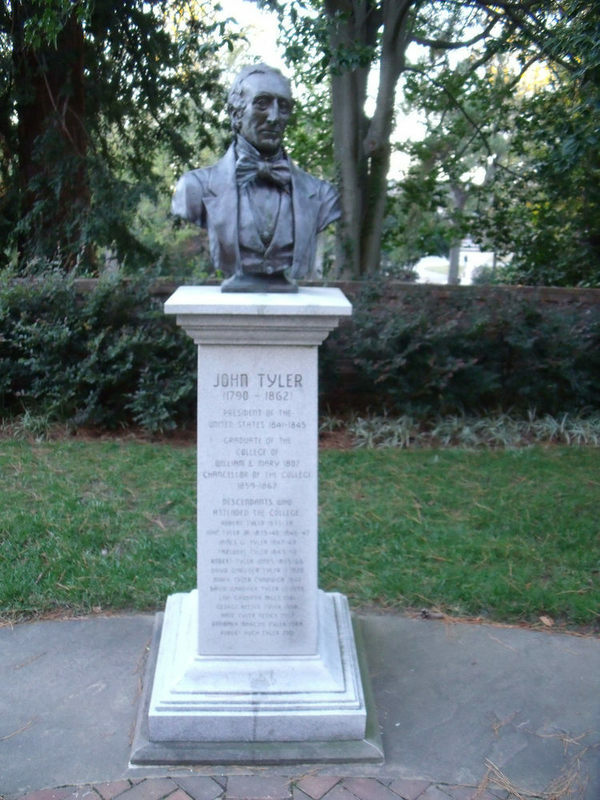 John Tyler Statue, 2011: A 2011 photo of the John Tyler bust in the Tyler Family Garden. John Tyler was President of the United States and Rector of the Board of Visitors. ~ Source: University Archives Photograph Collection, UA 8. ~ Creator: College of William and Mary. John Tyler Sr. 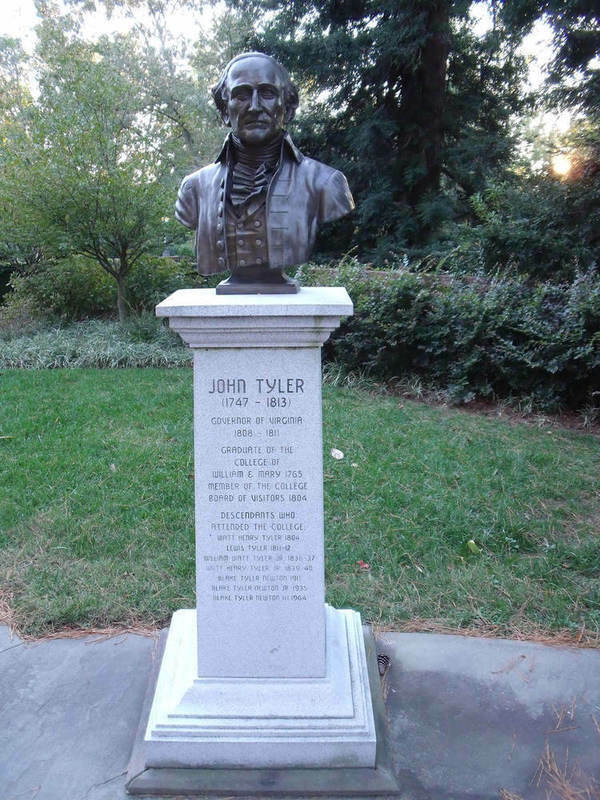 Statue, 2011: A 2011 photo of the bust of John Tyler Sr. in the Tyler Family Garden. John Tyler Sr. was Governor of Virginia from 1808-1811 and the father of John Tyler, President of the United States. ~ Source: University Archives Photograph Collection, UA 8. ~ Creator: College of William and Mary. 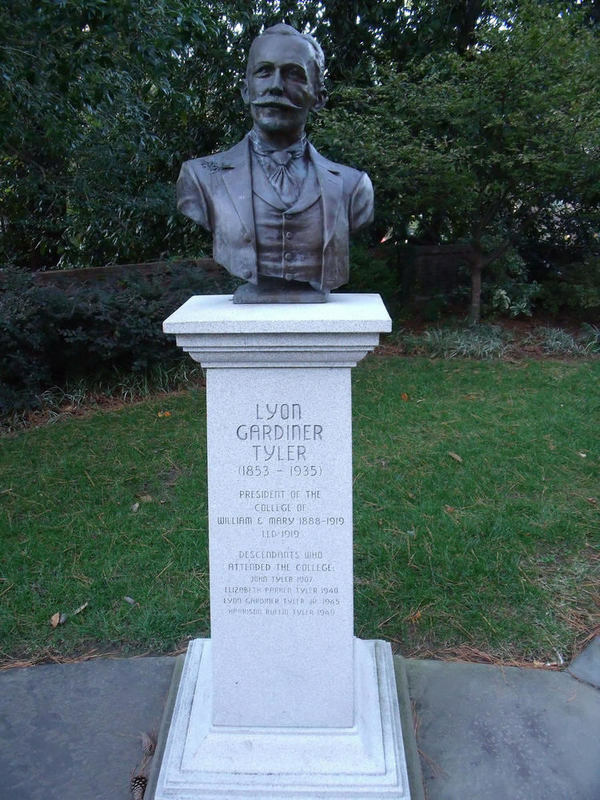 Lyon G. Tyler Statue, 2011: A 2011 photo of the Lyon Gardiner Tyler bust in the Tyler Family Garden. Tyler was president of William & Mary from 1888-1919 and helped usher in the first class of women in 1918. ~ Source: University Archives Photograph Collection, UA 8. ~ Creator: College of William and Mary. Special Collections Research Center, Swem Library, College of William and Mary., “Tyler Family Garden, Dedicated 2004,” TribeTrek, accessed April 26, 2019, https://tribetrek.wm.edu/items/show/12. "College of William and Mary"
This work is licensed by Earl Gregg Swem Library under a Creative Commons Attribution-NonCommercial-ShareAlike 4.0 International License.